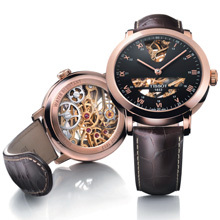 Carved out of a long tradition of craftsmanship, the new Tissot Sculpture Line Skeleton literally reveals all. The design of this solid gold timepiece provides several windows through which to view the workings of a fascinating mechanical movement. Confidently contemporary shapes and finishes tease with nostalgic touches, such as a finely stitched leather strap and Roman numerals around the dial. The Tissot Sculpture Line Skeleton is set to be the apple of the collector’s eye and to harvest admiration from stylish individuals everywhere who like to look beyond the surface. The Tissot Sculpture Line Skeleton comes with a choice of case, either rose or yellow gold, both in solid 18-carat quality. Smooth, polished surfaces and angular hands assign a modern Midas touch. A black dial makes an unmistakably modern statement. A silver-coloured alternative underlines the nostalgic character of the watch. Both models are finished off by a brown leather strap with a crocodile-print. Dedication to detail ensures that the attachment is kept in place by an elegant butterfly claps with push-buttons. This watch is about beauty that is far more than skin-deep. 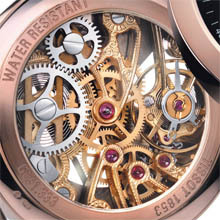 Visible through the completely see-through case back or through two substantial cutouts on the dial, is a Swiss-made skeleton mechanical movement. An intricate maze of metal elements joins forces to assure high precision, integrating a practical power reserve of 49 hours. Wearers and admirers can look on as wheels, balance springs and 17 jewels harmonise in a ballet of timekeeping. Humans have been fascinated by the passage of time for centuries. 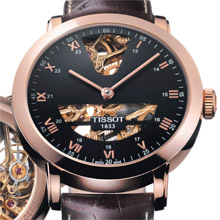 The Tissot Sculpture Line Skeleton promises to fuel that fascination for many years to come. • Leather strap with crocodile-print and a butterfly clasp with push-buttons.